It’s already been over a week since I left the Land of the Morning Calm and returned home – and discovered that Seoul has more snow than Michigan, which is terrible. Michigan, I feel betrayed! In my three heavy suitcases, I lugged back my earthly possessions: clothes, gifts, selfie sticks, and of course, books. Textbooks, biographies, and works by Andrei Lankov, obviously, but more pertinent to my language studies, I brought back books in Korean. I am a firm believer that the more you read, the wiser you can become, and the better you learn to write and comprehend. It doesn’t matter what language you read in; it will help you. Korean is no exception, which is why I pushed myself to buy two novels that I know I cannot read without laboring over each paragraph. You can’t get better without challenging yourself. I also chose to buy poetry, because poetry is artistic and allows one to learn about the creative soul within a language. Poetry, as I mentioned before, lends itself to language learning because it introduces a learner to words not necessarily found in everyday speech, but words that give the user a touch of fluency. One can use textbooks to speak easily and conversationally about the weather, about classes, and about the careers of family members, but to take that one step further and use the weather as an analogy for emotions, to talk about life lessons rather than coursework, and to converse on the hopes and dreams of a human being – this is where poetry can help build fluency. Poetry is not for everyone. I remember taking poetry in seventh and eighth grade and being the sole individual in the class who enjoyed it. And yes, I still have one of those poems posted on my wall (Mary Oliver’s Wild Geese – PS(A), Mary Oliver’s poetry is awesome). But if you enjoy reading, and perhaps have read a poem or two, I highly recommend finding a bilingual book of poetry in Korean. Translated from English or Korean originals alike – they will help. I personally love Shel Silverstein, so I bought a book I read innumerable times in childhood – “Where the Sidewalk Ends” – translated into Korean as “골목길이 끝나는 곳.” Incredibly enough, this translation manages to capture the sing-songy rhythm of the English originals. I hope you can enjoy this embarrassing attempt to read one such poem to my 3 month old nephew – it was when I was still in Korea and had not yet met him, so I sent a recording to my sister! A dear Korean friend of mine and my language partner for this past semester bought me a collection of Korean poems as a goodbye gift. “한국인이 가장 좋아하는 명시 100선” is a collection of Korean people’s 100 most beloved poems, and it’s organized according to feelings – feelings of nostalgia, love, longing, and loneliness. I had the pleasure of attending Professor McCann’s guest lecture at my home university last year (early 2014) when he spoke at length about traditional Korean poetry, also known as 시조 (sijo). I fell in love with sijo, and borrowed a bilingual book of poetry from the Nam Center for Korean Studies, which pushed me to further explore studying Korean via poetry and novels. (The book was called “겨울밤 0시 5분” or “Winter, 5 Minutes Past Midnight“ and was the third volume of a series released by NEALRC – I highly recommend it). As I bought The Maze Runner while waiting for my flight from Dallas to Seoul over four months ago, saw the movie in Sindorim, and encountered a Kyobo book sale on the street in Sinchon, naturally I had to buy the second book – 스코치 트라이얼 (The Scorch Trials) – for a fraction of the list price (Originally 값 14,800원 = about $14 USD, I think I paid paid a whopping 6,000원 because of their huge sale). I read the second book in English on my Kindle, and have begun making my slow way through it in Korean. Huzzah for numerous unknown words! But there’s a Korean character named Minho, and for his sake I shall persevere. 잘 생긴 민호! 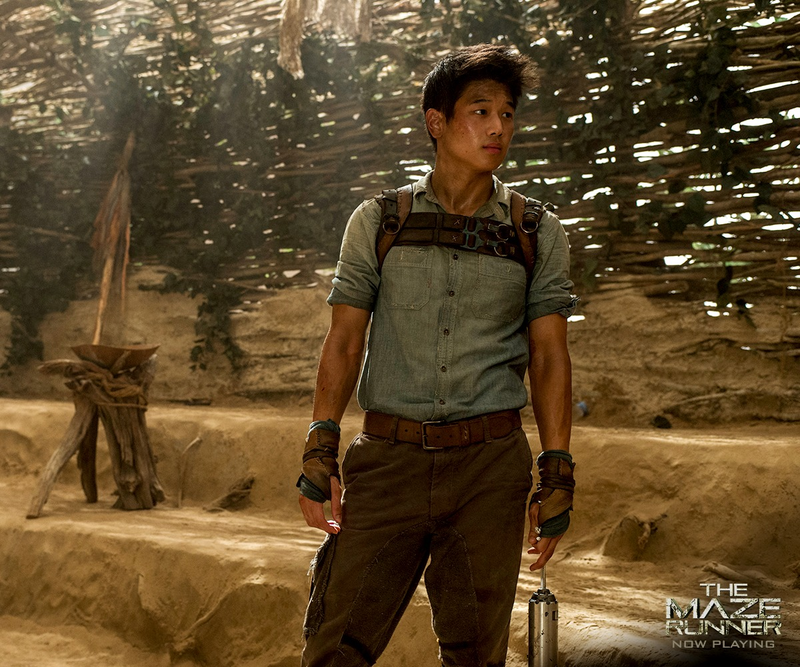 I am also a fan of Newt…but that Minho though. I naturally had to buy The Hobbit in Korean – after all, I saw the final film on one of my last days in Korea, and definitely had a lot of rain on my face during the credits song, The Last Farewell. Of course I felt absolutely no emotional connection between that song and the end of my semester abroad. Nope. None at all. Reading 호빗 has been particularly rewarding because it’s another book I grew up reading, which makes it easier to push through the Korean words since I know the story so well. Is it slow going? Yes. But it’s still rewarding and entertaining. I’d like to briefly mention that at the beginning of my study abroad, I bought Tablo’s Pieces of You (당신의 조각들) in both English and Korean. I have not yet unwrapped the English one because I want to read the Korean one in totality before I open the English one. But if you get the chance, I deeply recommend Tablo’s writings to you. If you haven’t ever listened to his solo songs or Epik High, now’s the moment to do so. He is a fantastic lyricist and you won’t regret poring over translations of his songs while listening to them on repeat. He wrote this series of short fiction when he was only 19 and years later, the published translations became a huge hit in South Korea. Tablo is a true wordsmith. Can’t forget about Big Bang. And of course, I own Big Bang’s 세상에 너를 소리쳐! (thanks to Kirsten’s recommendation on her blog Korean Notebook), a book which was published years ago and details their feelings and experiences as they grew into the group that they are today. Also, to brag just because I can, I saw Taeyang of Big Bang and Psy perform live in club nb in Gangnam (yes, I have sung 눈, 코, 입 together with Taeyang, who stood five feet away, and I have danced to Gangnam Style IN Gangnam performed live by Psy himself), gone to Epik High’s opening concert in Seoul and watched them walk past me in Hongdae (there was naught but a foot of space between Tablo, Mithra, and DJ Tukutz and me….wow)…and I should mention that at Roy Kim’s concert, he danced his way past me in a red suit. I saw Shin Sekyung in Hongdae my second day there, but that pales in comparison to my other star-struck moments in Seoul. Oh, and Hwangssabu approved my Instagram photo outside YG Entertainment. And people wonder why being home has made me lethargic. Awesome! I am in Korea now but I go back to Japan in a few days. I want to make a book store run and this gave me a lot of good ideas! I really want to be able to read more because right now mostly my skills are in listening and conversation. Thanks for posting! Sounds like you have some really great resources. Awesome! Same here ㅎㅎ except it probably won’t be for a while….gotta study a lot in the meantime to keep up my Korean! I did the same with the street signs – they really do help!! Hi, just like you. I really love poem 🙂 I own a copy of tablo’s pieces of you too! Anyway,would you recommend the book “한국인이 가장 좋아하는 명시 100선”? I am thinking of purchasing it! Just want to know, where do you get Tablo’s book from? I’m visiting Seoul this coming week and would want to buy his book! Is there any particular bookstore that I can visit to get his book? Thank you so much!! If you speak some Korean, you can ask any employee where to find the book (show them a piece of paper with the name and author written/typed in 한글 on it if it makes it easier for you!) and they’ll look it up on a computer and print out a little receipt with the exact section, row, and shelf where you can find the book^^ If you’re very comfortable with Korean, you can even use a kiosk to search the location yourself. PS, the English version they had actually included a few extra short stories written by Tablo as well. Glad to help 🙂 Let me know how it goes!